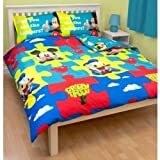 Please note: This product is a UK import, the sheets supplied are slightly smaller than the standard US duvet size, it will fit but the duvet may fold at the edge when covered. This is not a comforter but sheets for a duvet. High quality girls bedding set. Size – Duvet sheet: 53 x 79 inches. This entry was posted on Tuesday, November 12th, 2013 at 4:31 pm	and is filed under Quilts for Kids. You can follow any responses to this entry through the RSS 2.0 feed. You can leave a response, or trackback from your own site.